Amrith Bdr Subba's Diary|: A passion so wild! One thing that makes me feel good after I went to Australia is that I could learn how to ride a bicycle despite being blind. The house I was living in had a small backyard where I could practice cycling during my leisure time as there were a few bicycles collected from the roadsides. At first, my wife and housemates feared that I might fall down and break my limbs but I learned that it was normal for the beginners to fall down a couple of times before becoming a real expert. So, I too fell down a few times injuring my knees and palms but I didn’t give it up. I kept practicing until I began to gain some balance and eventually I could ride the bicycle, all on my own. I had a cognitive map of the backyard which helped me navigate around very safely. My friends were shocked to see me cycling, round and round the backyard without crashing into the walls that surrounded the backyard on three sides. Of course, I once made a mistake and crashed against the wall throwing myself down on the concrete floor. I could not get up for a few seconds as the handle of the bicycle had hit my belly. But nothing tragic happened. It was a very good learning experience. After I could comfortably ride the bicycle, it became part of my regular physical exercise in the morning and evening. It was a wonderful experience because that was something I truly loved doing. Whenever I got tired of working on assignments or whenever I couldn’t fall asleep on time at night, cycling helped me a lot in relieving my stress and refreshing my brain. 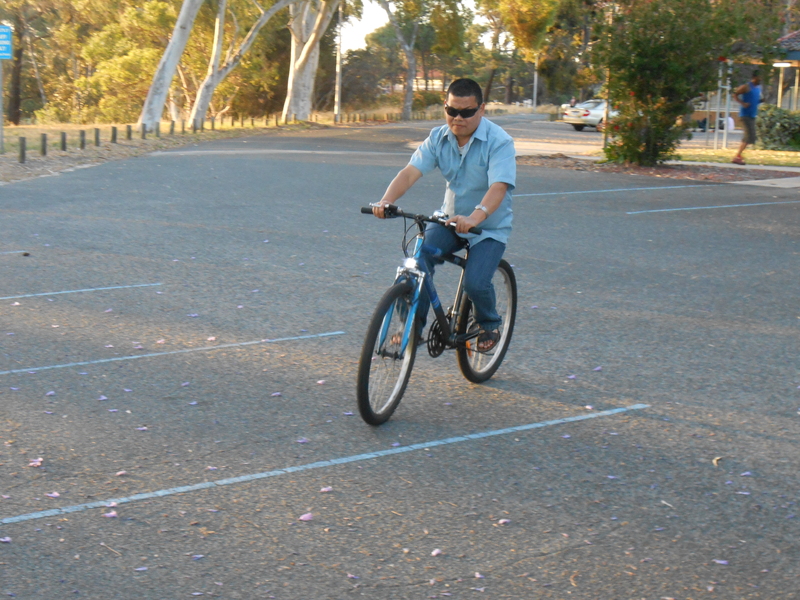 I still miss those bicycles and those wonderful moments in Perth, Western Australia. I think I could even inspire some of my friends who couldn’t ride a bicycle because they too started learning how to ride it afterwards. Below is the video of me cycling at the backyard of the house I was living in. 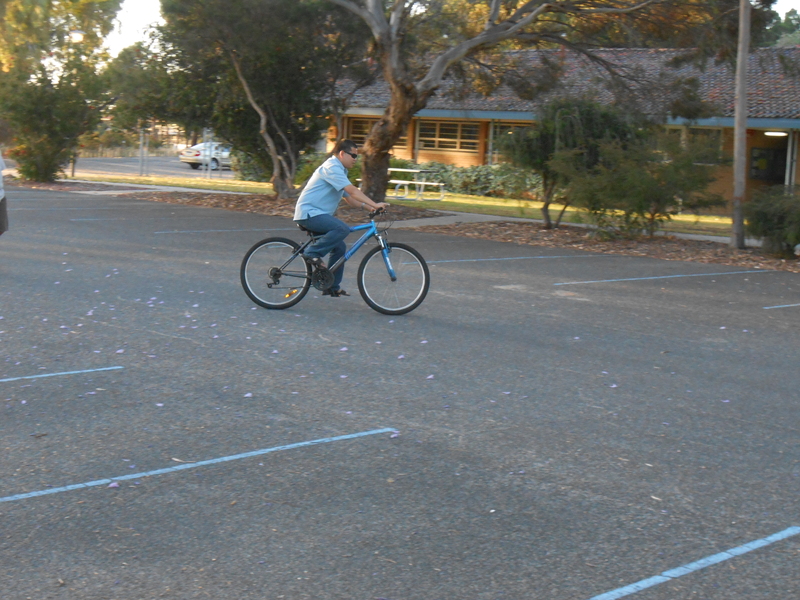 I also used to go with my friends out in the parking lot of Canning College to cycle. It was a lovely experience. I wish if there were a safe space here in Thimphu too where I can continue my passion. If I had eyesight, I would have cycled to and from office everyday. It's not wild, Sir. I can call it "A passion so daring!" I absolutely to see this video of yours and wonder how could you do it, gosh. So the only stones unturned are driving and flying. I wish to see you doing that too. Loved the post thoroughly though. Wow!!! That's amazing!!! I salute you knowing how to judge where you go round and round - all in the perfect round!!! Many many thanks for your comment, Rima. Good to know that u love cycling too...... It's not safe to cycle here in Bhutan. So I think I should not pursue my passion further now. lol! Thanks, Riku, for your wishes. I too wish if I could drive a car someday..... But I think that would be too wild... LoL! Sir, u r really an inspiration in every way. Many many thanks for your kind encouragement la. I am so much happy to receive your comments on my articles. As an ordinary blogger, there is no more happiness to have people visiting my blog and leaving comments. Really feeling motivated. Keep coming back please.